The Leamington Station has had associated with it some striking personalities, amongst them that of the late Mr. Joseph Arch. 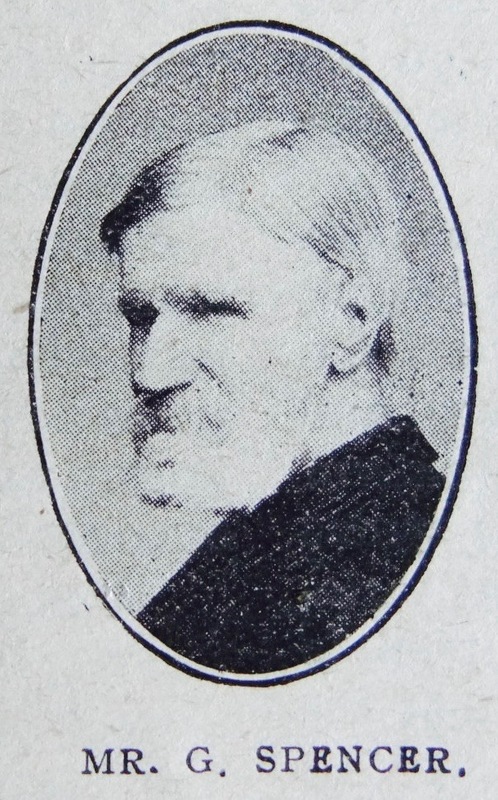 Perhaps the most outstanding of those who remain is Mr. George Spencer of Southam. When it is said that he is ninety years of age, and has been blind for seventy-six years, and yet has achieved no mean success as a business man, musician, politician, poet and preacher of the Gospel, it will be realised that he is at least a man of unusual gifts and character. The son of a Congregational Minister, who became Headmaster of an Endowed Grammar School, he inherited aptitudes for literary and oratorical pursuits, that account for the most striking features of his career. Born on December 14th, 1830, he enjoyed through his boyhood the advantage of superior intellectual and religious environment. It was fortunate for him that in this formative period of life, he had the use of his eyesight, and thus in scholarship obtained a grounding that was of immense service in after life, and also gained a sense of his surroundings in nature that memory and reflection used afterwards with such excellent effect. At the age of fourteen years, an accident deprived him of sight, and this, no doubt, deflected him from the course life might have otherwise followed. For two-and-a-half years he enjoyed the advantage of an Institution for the Blind, and then came forth to face the world with what equipment he had been able to gain. Much of his success can be attributed to the fact that he was early the subject of a great spiritual awakening. It was in a very quiet and characteristic way that he reached the crisis of his spiritual life. A lady spoke to him seriously about his soul, and this led him to face the question of his responsibility to God, and his privilege in Jesus Christ. Pondering earnestly these great questions, be determined to consecrate himself and his whole life to the service of God and humanity. So in his twentieth year he surrendered himself fully to his Saviour and Lord. He now felt intensely the obligation to make the most of his life for his Master. There were many temptations to yield to the restrictions of his affliction and live a life of severe limitation and seclusion, but he refused to yield to despair, or to allow his disability to cripple his activities and devotion. He commenced business as a Stationer, &c., in Southam, and still runs both that establishment and another for the sale of boots and shoes. He distributed his magazines and newspapers personally not only in the town, but also in many villages for miles round. In spite of his blindness, his acquaintance with the neighbourhood is closer and more detailed than that of most of the dwellers therein. His call to the pulpit was, to him, unmistakably from God. On a certain date, the husband of the lady, who had spoken to him about his soul, was appointed to preach; but died before the date was reached. The church officials called on Mr. Spencer to fill the gap, and with the promise of assistance from them he undertook to do his best. Feeling deeply the responsibility of his task; he earnestly besought help and guidance from God, and not in vain. The services were impressive and powerful, and some were led to repentance. This was the beginning of a powerful ministry which continued for over sixty years. In “rain or shine,” and over distances that men nowadays are unwilling to cover, he toiled and adventured for Christ. For it should be remembered, he could only travel on foot, and then amid risks that would have daunted many. For example, on one journey he was attacked by a bull, whose roaring and stamping he could hear, though, of course, he could not see the animal. A gracious Providence preserved him in this and many perils, and he held fearlessly on his way. He never doubted his call to preach Christ’s Gospel, and was impelled both by an imperative sense of duty, and held by his appreciation of the matchless privilege and honour of his vocation. He was helped in his religious activities by his skill as a musician, and often led the singing at open-air and other gatherings with his flute. He has had the joy of leading hundreds of persons to Christ, and so extending the Redeemer’s Kingdom in his own and other neighbourhoods. In addition to his successful business, and church activities, Mr. Spencer was interested and active in public affairs. His was not a district where it was to any man’s advantage commercially to advocate progressive politics, but our friend did not shrink from either the toil or the sacrifice, which this line of service demanded. His versatility was displayed, also, in a determined and successful effort to utter himself in poetic form. He was compelled first to gather ideas and information from what was read to him by others; and then make use of an amanuensis for writing and revision. These were formidable difficulties, but he would not be dismayed, and so at length by persistent effort, a small collection of poems was printed, and has had a considerable local circulation. It is a creditable monument of Mr. Spencer’s mental power and literary ability. To face life in this challenging fashion, and on so many sides of it, required magnificent courage, and an indomitable resolution: but our brother fought his way through, and in his old age can look back on a stainless record, and a manifold and useful life. From the beginning, Mr. Spencer has been a generous supporter of his church, and his benefactions are as free and extensive to-day as ever. His home is yet at the disposal of ministers and preachers; and it is his greatest delight to have a talk with any who can give him information on the course of affairs. The shadows are falling about our dear old friend, but he is undismayed. His faith never waivers in the infinite love of God, and he knows that ere long his loving Father will bring him into the Light of His own presence. This is the glad hope that animates him in these days of extreme age; and the summons will find him ready with a joyous response. George was baptised on 24 April 1931 at Glossop, Derbyshire. His parents were George and Elizabeth. The family had moved to Bradfield, Yorkshire by the time of the 1851 census. George is described as a music teacher. He married Sarah, born abt 1809 at Marylebone, London, before the 1861 census. She died in 1887 at Southam. George died on 16 February 1922 at Southam, Warwickshire.